Finland in the early 2000s is a small industrialized country with a standard of living ranked among the top twenty in the world. At the beginning of the twentieth century it was a poor agrarian country with a gross domestic product per capita less than half of that of the United Kingdom and the United States, world leaders at the time in this respect. Finland was part of Sweden until 1809, and a Grand Duchy of Russia from 1809 to 1917, with relatively broad autonomy in its economic and many internal affairs. It became an independent republic in 1917. While not directly involved in the fighting in World War I, the country went through a civil war during the years of early independence in 1918, and fought against the Soviet Union during World War II. Participation in Western trade liberalization and bilateral trade with the Soviet Union required careful balancing of foreign policy, but also enhanced the welfare of the population. Finland has been a member of the European Union since 1995, and has belonged to the European Economic and Monetary Union since 1999, when it adopted the euro as its currency. Finland has large forest areas of coniferous trees, and forests have been and still are an important natural resource in its economic development. Other natural resources are scarce: there is no coal or oil, and relatively few minerals. Outokumpu, the biggest copper mine in Europe in its time, was depleted in the 1980s. Even water power is scarce, despite the large number of lakes, because of the small height differences. The country is among the larger ones in Europe in area, but it is sparsely populated with 44 people per square mile, 5.3 million people altogether. The population is very homogeneous. There are a small number of people of foreign origin, about two percent, and for historical reasons there are two official language groups, the Finnish-speaking majority and a Swedish-speaking minority. In recent years population has grown at about 0.3 percent per year. Finland was an agrarian country in the 1800s, despite poor climatic conditions for efficient grain growing. Seventy percent of the population was engaged in agriculture and forestry, and half of the value of production came from these primary industries in 1900. Slash and burn cultivation finally gave way to field cultivation during the nineteenth century, even in the eastern parts of the country. Some iron works were founded in the southwestern part of the country in order to process Swedish iron ore as early as in the seventeenth century. Significant tar burning, sawmilling and fur trading brought cash with which to buy a few imported items such as salt, and some luxuries – coffee, sugar, wines and fine cloths. The small towns in the coastal areas flourished through the shipping of these items, even if restrictive legislation in the eighteenth century required transport via Stockholm. The income from tar and timber shipping accumulated capital for the first industrial plants. The nineteenth century saw the modest beginnings of industrialization, clearly later than in Western Europe. The first modern cotton factories started up in the 1830s and 1840s, as did the first machine shops. The first steam machines were introduced in the cotton factories and the first rag paper machine in the 1840s. The first steam sawmills were allowed to start only in 1860. The first railroad shortened the traveling time from the inland towns to the coast in 1862, and the first telegraphs came at around the same time. Some new inventions, such as electrical power and the telephone, came into use early in the 1880s, but generally the diffusion of new technology to everyday use took a long time. The export of various industrial and artisan products to Russia from the 1840s on, as well as the opening up of British markets to Finnish sawmill products in the 1860s were important triggers of industrial development. From the 1870s on pulp and paper based on wood fiber became major export items to the Russian market, and before World War I one-third of the demand of the vast Russian empire was satisfied with Finnish paper. Finland became a very open economy after the 1860s and 1870s, with an export share equaling one-fifth of GDP and an import share of one-fourth. A happy coincidence was the considerable improvement in the terms of trade (export prices/import prices) from the late 1860s to 1900, when timber and other export prices improved in relation to the international prices of grain and industrial products. Sources: Heikkinen and van Zanden 2004; Hjerppe 1989. Finland participated fully in the global economy of the first gold-standard era, importing much of its grain tariff-free and a lot of other foodstuffs. Half of the imports consisted of food, beverages and tobacco. Agriculture turned to dairy farming, as in Denmark, but with poorer results. The Finnish currency, the markka from 1865, was tied to gold in 1878 and the Finnish Senate borrowed money from Western banking houses in order to build railways and schools. GDP grew at a slightly accelerating average rate of 2.6 percent per annum, and GDP per capita rose 1.5 percent per year on average between 1860 and 1913. The population was also growing rapidly, and from two million in the 1860s it reached three million on the eve of World War I. Only about ten percent of the population lived in towns. The investment rate was a little over 10 percent of GDP between the 1860s and 1913 and labor productivity was low compared to the leading nations. Accordingly, economic growth depended mostly on added labor inputs, as well as a growing cultivated area. The revolution of 1917 in Russia and Finland’s independence cut off Russian trade, which was devastating for Finland’s economy. The food situation was particularly difficult as 60 percent of grain required had been imported. Postwar reconstruction in Europe and the consequent demand for timber soon put the economy on a swift growth path. 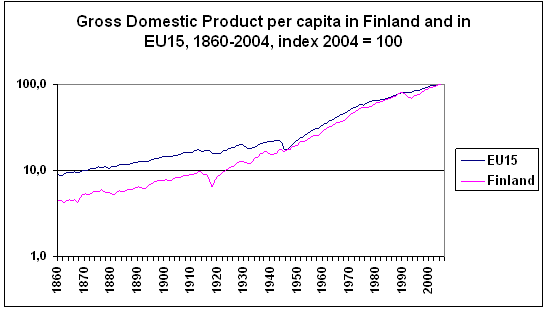 The gap between the Finnish economy and Western economies narrowed dramatically in the interwar period, although it remained the same among the Scandinavian countries, which also experienced fast growth: GDP grew by 4.7 percent per annum and GDP per capita by 3.8 percent in 1920–1938. The investment rate rose to new heights, which also improved labor productivity. The 1930s depression was milder than in many other European countries because of the continued demand for pulp and paper. On the other hand, Finnish industries went into depression at different times, which made the downturn milder than it would have been if all the industries had experienced their troughs simultaneously. The Depression, however, had serious and long-drawn-out consequences for poor people. The land reform of 1918 secured land for tenant farmers and farm workers. A large number of new, small farms were established, which could only support families if they had extra income from forest work. The country remained largely agrarian. On the eve of World War II, almost half of the labor force and one-third of the production were still in the primary industries. Small-scale agriculture used horses and horse-drawn machines, lumberjacks went into the forest with axes and saws, and logs were transported from the forest by horses or by floating. Tariff protection and other policy measures helped to raise the domestic grain production to 80–90 percent of consumption by 1939. Soon after the end of World War I, Finnish sawmill products, pulp and paper found old and new markets in the Western world. The structure of exports became more one-sided, however. Textiles and metal products found no markets in the West and had to compete hard with imports on the domestic market. More than four-fifths of exports were based on wood, and one-third of industrial production was in sawmilling, other wood products, pulp and paper. Other growing industries included mining, basic metal industries and machine production, but they operated on the domestic market, protected by the customs barriers that were typical of Europe at that time. Finland came out of World War II crippled by the loss of a full tenth of its territory, and with 400.000 evacuees from Karelia. Productive units were dilapidated and the raw material situation was poor. The huge war reparations to the Soviet Union were the priority problem of the decision makers. The favorable development of the domestic machinery and shipbuilding industries, which was based on domestic demand during the interwar period and arms deliveries to the army during the War made war-reparations deliveries possible. They were paid on time and according to the agreements. At the same time, timber exports to the West started again. Gradually the productive capacity was modernized and the whole industry was reformed. Evacuees and soldiers were given land on which to settle, and this contributed to the decrease in farm size. Finland became part of the Western European trade-liberalization movement by joining the World Bank, the International Monetary Fund (IMF) and the Bretton Woods agreement in 1948, becoming a member of the General Agreement on Tariffs and Trade (GATT) two years later, and joining Finnefta (an agreement between the European Free Trade Area (EFTA) and Finland) in 1961. The government chose not to receive Marshall Aid because of the world political situation. Bilateral trade agreements with the Soviet Union started in 1947 and continued until 1991. Tariffs were eased and imports from market economies liberated from 1957. Exports and imports, which had stayed at internationally high levels during the interwar years, only slowly returned to the earlier relative levels. The investment rate climbed to new levels soon after War World II under a government policy favoring investments and it remained on this very high level until the end of the 1980s. The labor-force growth stopped in the early 1960s, and economic growth has since depended on increases in productivity rather than increased labor inputs. GDP growth was 4.9 percent and GDP per capita 4.3 percent in 1950–1973 – matching the rapid pace of many other European countries. Exports and, accordingly, the structure of the manufacturing industry were diversified by Soviet and, later, on Western orders for machinery products including paper machines, cranes, elevators, and special ships such as icebreakers. The vast Soviet Union provided good markets for clothing and footwear, while Finnish wool and cotton factories slowly disappeared because of competition from low-wage countries. The modern chemical industry started to develop in the early twentieth century, often led by foreign entrepreneurs, and the first small oil refinery was built by the government in the 1950s. The government became actively involved in industrial activities in the early twentieth century, with investments in mining, basic industries, energy production and transmission, and the construction of infrastructure, and this continued in the postwar period. The new agricultural policy, the aim of which was to secure reasonable incomes and favorable loans to the farmers and the availability of domestic agricultural products for the population, soon led to overproduction in several product groups, and further to government-subsidized dumping on the international markets. The first limitations on agricultural production were introduced at the end of the 1960s. The population reached four million in 1950, and the postwar baby boom put extra pressure on the educational system. The educational level of the Finnish population was low in Western European terms in the 1950s, even if everybody could read and write. The underdeveloped educational system was expanded and renewed as new universities and vocational schools were founded, and the number of years of basic, compulsory education increased. Education has been government run since the 1960s and 1970s, and is free at all levels. Finland started to follow the so-called Nordic welfare model, and similar improvements in health and social care have been introduced, normally somewhat later than in the other Nordic countries. Public child-health centers, cash allowances for children, and maternity leave were established in the 1940s, and pension plans have covered the whole population since the 1950s. National unemployment programs had their beginnings in the 1930s and were gradually expanded. A public health-care system was introduced in 1970, and national health insurance also covers some of the cost of private health care. During the 1980s the income distribution became one of the most even in the world. 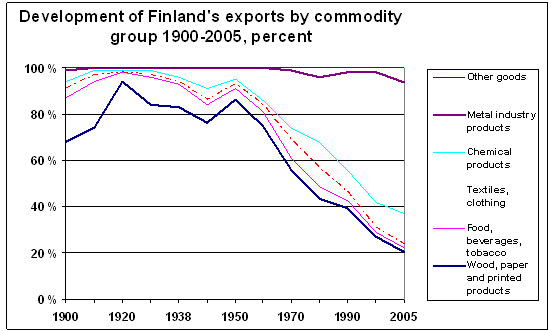 The oil crises of the 1970s put the Finnish economy under pressure. Although the oil reserves of the main supplier, the Soviet Union, showed no signs of running out, the price increased in line with world market prices. This was a source of devastating inflation in Finland. On the other hand, it was possible to increase exports under the terms of the bilateral trade agreement with the Soviet Union. This boosted export demand and helped Finland to avoid the high and sustained unemployment that plagued Western Europe. Economic growth in the 1980s was somewhat better than in most Western economies, and at the end of the 1980s Finland caught up with the sluggishly-growing Swedish GDP per capita for the first time. In the early 1990s the collapse of the Soviet trade, Western European recession and problems in adjusting to the new liberal order of international capital movement led the Finnish economy into a depression that was worse than that of the 1930s. GDP fell by over 10 percent in three years, and unemployment rose to 18 percent. The banking crisis triggered a profound structural change in the Finnish financial sector. The economy revived again to a brisk growth rate of 3.6 percent in 1994-2005: GDP growth was 2.5 percent and GDP per capita 2.1 percent between 1973 and 2005. Electronics started its spectacular rise in the 1980s and it is now the largest single manufacturing industry with a 25 percent share of all manufacturing. Nokia is the world’s largest producer of mobile phones and a major transmission-station constructor. Connected to this development was the increase in the research-and- development outlay to three percent of GDP, one of the highest in the world. The Finnish paper companies UPM-Kymmene and M-real and the Finnish-Swedish Stora-Enso are among the largest paper producers in the world, although paper production now accounts for only 10 percent of manufacturing output. The recent discussion on the future of the industry is alarming, however. The position of the Nordic paper industry, which is based on expensive, slowly-growing timber, is threatened by new paper factories founded near the expanding consumption areas in Asia and South America, which use local, fast-growing tropical timber. The formerly significant sawmilling operations now constitute a very small percentage of the activities, although the production volumes have been growing. The textile and clothing industries have shrunk into insignificance. What has typified the last couple of decades is the globalization that has spread to all areas. Exports and imports have increased as a result of export-favoring policies. Some 80 percent of the stocks of Finnish public companies are now in foreign hands: foreign ownership was limited and controlled until the early 1990s. A quarter of the companies operating in Finland are foreign-owned, and Finnish companies have even bigger investments abroad. Most big companies are truly international nowadays. Migration to Finland has increased, and since the collapse of the eastern bloc Russian immigrants have become the largest single foreign group. The number of foreigners is still lower than in many other countries – there are about 120.000 people with foreign background out of a population of 5.3 million. The directions of foreign trade have been changing because trade with the rising Asian economies has been gaining in importance and Russian trade has fluctuated. Otherwise, almost the same country distribution prevails as has been common for over a century. Western Europe has a share of three-fifths, which has been typical. The United Kingdom was for long Finland’s biggest trading partner, with a share of one-third, but this started to diminish in the 1960s. Russia accounted for one-third of Finnish foreign trade in the early 1900s, but the Soviet Union had minimal trade with the West at first, and its share of the Finnish foreign trade was just a few percentage points. 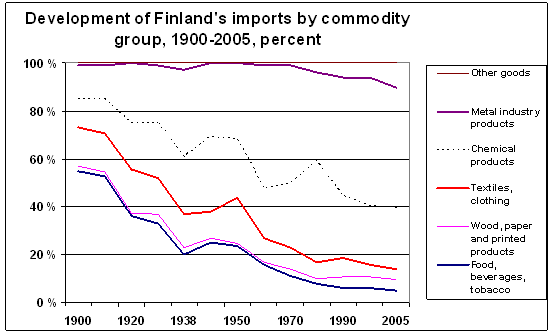 After World War II Soviet-Finnish trade increased gradually until it reached 25 percent of Finnish foreign trade in the 1970s and early 1980s. Trade with Russia is now gradually gaining ground again from the low point of the early 1990s, and had risen to about ten percent in 2006. This makes Russia one of Finland’s three biggest trading partners, Sweden and Germany being the other two with a ten percent share each. 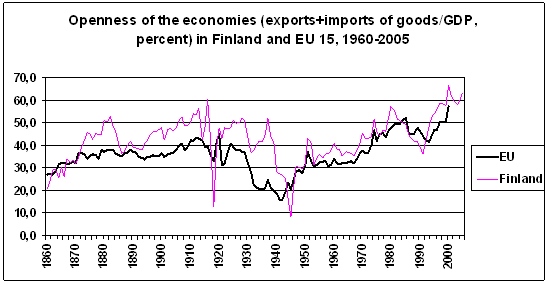 The balance of payments was a continuing problem in the Finnish economy until the 1990s. Particularly in the post-World War II period inflation repeatedly eroded the competitive capacity of the economy and led to numerous devaluations of the currency. An economic policy favoring exports helped the country out of the depression of the 1990s and improved the balance of payments. Agriculture continued its problematic development of overproduction and high subsidies, which finally became very unpopular. The number of farms has shrunk since the 1960s and the average size has recently risen to average European levels. The share of agricultural production and labor are also on the Western European levels nowadays. Finnish agriculture is incorporated into the Common Agricultural Policy of the European Union and shares its problems, even if Finnish overproduction has been virtually eliminated. The share of forestry is equally low, even if it supplies four-fifths of the wood used in Finnish sawmills and paper factories: the remaining fifth is imported mainly from the northwestern parts of Russia. The share of manufacturing is somewhat above Western European levels and, accordingly, that of services is high but slightly lower than in the old industrialized countries. Recent discussion on the state of the economy mainly focuses on two issues. The very open economy of Finland is very much influenced by the rather sluggish economic development of the European Union. Accordingly, not very high growth rates are to be expected in Finland either. Since the 1990s depression, the investment rate has remained at a lower level than was common in the postwar period, and this is cause for concern. The other issue concerns the prominent role of the public sector in the economy. The Nordic welfare model is basically approved of, but the costs create tensions. High taxation is one consequence of this and political parties discuss whether or not the high public-sector share slows down economic growth. The aging population, high unemployment and the decreasing numbers of taxpayers in the rural areas of eastern and central Finland place a burden on the local governments. There is also continuing discussion about tax competition inside the European Union: how does the high taxation in some member countries affect the location decisions of companies? Note on classification: Metal industry products SITC 28, 67, 68, 7, 87; Chemical products SITC 27, 32, 33, 34, 5, 66; Textiles SITC 26, 61, 65, 84, 85; Wood, paper and printed products SITC 24, 25, 63, 64, 82; Food, beverages, tobacco SITC 0, 1, 4. Heikkinen, S. and J.L van Zanden, eds. Explorations in Economic Growth. Amsterdam: Aksant, 2004. Heikkinen, S. Labour and the Market: Workers, Wages and Living Standards in Finland, 1850–1913. Commentationes Scientiarum Socialium 51 (1997). Hjerppe, R. The Finnish Economy 1860–1985: Growth and Structural Change. Studies on Finland’s Economic Growth XIII. Helsinki: Bank of Finland Publications, 1989. Jalava, J., S. Heikkinen and R. Hjerppe. “Technology and Structural Change: Productivity in the Finnish Manufacturing Industries, 1925-2000.” Transformation, Integration and Globalization Economic Research (TIGER), Working Paper No. 34, December 2002. Kaukiainen, Yrjö. A History of Finnish Shipping. London: Routledge, 1993. Myllyntaus, Timo. Electrification of Finland: The Transfer of a New Technology into a Late Industrializing Economy. Worcester, MA: Macmillan, Worcester, 1991. Ojala, J., J. Eloranta and J. Jalava, editors. The Road to Prosperity: An Economic History of Finland. Helsinki: Suomalaisen Kirjallisuuden Seura, 2006. Pekkarinen, J. and J. Vartiainen. Finlands ekonomiska politik: den långa linjen 1918–2000, Stockholm: Stiftelsen Fackföreningsrörelsens institut för ekonomisk forskning FIEF, 2001.